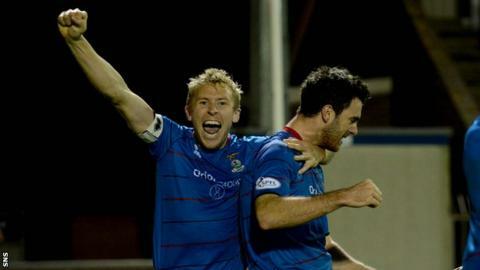 Inverness Caledonian Thistle captain Richie Foran has signed a new three-year deal with the Highland outfit. The Irishman, who would have been out of contract in the summer, has committed to the club until May 2017. "Inverness is a special place with a very special football club and I'm delighted to commit my future to here," the 33-year-old told the club website. "I've had a marvellous five years with Caley Thistle and I've been made to feel very wanted." Foran has scored 38 goals in 155 appearances for Caley Thistle since moving from Southend United in 2009. Inverness, currently second top of the table behind Celtic, are stepping up their search for a new manager following Terry Butcher's move to Premiership rivals Hibernian. And the club have revealed they will have six names on their shortlist before the weekend. Former Scotland player Duncan Shearer and fellow youth coach Scott Kellacher will be in charge for Saturday's home game against St Johnstone. "The spirit among the players is very positive, they're a great bunch of lads, and the motivation levels are high," added Foran. "Duncan and Scott are doing a wonderful job, putting together first-class training sessions and we're all looking forward to the St Johnstone game on Saturday and beyond. "In due course, I intend to study for my coaching badges, but I'm enjoying my season and my target to is to play well for this club for as long as I can." Inverness chairman Kenny Cameron said he was delighted Foran had signed a new deal, describing him as "an inspirational leader". "Richie is a winner and it's important that we have ensured that he remains here to continue his important contribution not only this season but in seasons to come," he added.